Check out this adorable new clutch from LaLicious! 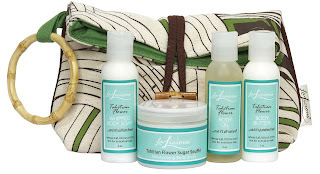 It comes with LaLicious' four signature products: Sugar Soué Scrub, Body Butter, Whipped Body Soap and Body Oil, all 2 oz, perfect for traveling. The bag itself is worth the buy...so cute and stylish for a night out! Register for LaLicious Steals & Deals Newsletter and get 15% off your first order! and in peak condition for defense against the sultry summer sun. LaLicious products and treatments are available at www.LaLicious.com and at select retailers and spas across the country.